বিন্দিটার এমনি পোড়া কপাল বটে! যতদিন বেঁচে ছিল রূপে গুণে কোনো যশ পায় নি — মরবার বেলাও যে একটু ভেবে চিন্তে এমন একটা নতুন ধরনে মরবে যাতে দেশের পুরুষরা খুশি হয়ে হাততালি দেবে তাও তার ঘটে এল না। মরেও লোকদের চটিয়ে দিলে! সেই মৃত্যুর বাঁশি এই বালিকার ভাঙা হৃদয়ের ভিতর দিয়ে আমার জীবনের যমুনাপারে যেদিন বাজল সেদিন প্রথমটা আমার বুকের মধ্যে যেন বাণ বিঁধল। বিধাতাকে জিজ্ঞাসা করলুম, জগতের মধ্যে যা-কিছু সব চেয়ে তুচ্ছ তাই সব চেয়ে কঠিন কেন? এই গলির মধ্যকার চারি-দিকে-প্রাচীর-তোলা নিরানন্দের অতি সামান্য বুদ্‌বুদটা এমন ভয়ংকর বাধা কেন। তোমার বিশ্বজগৎ তার ছয় ঋতুর সুধাপাত্র হাতে করে যেমন করেই ডাক দিক-না, এক মুহূর্তের জন্যে কেন আমি এই অন্দরমহলটার এইটুকু মাত্র চৌকাঠ পেরতে পারি নে। তোমার এমন ভুবনে আমার এমন জীবন নিয়ে কেন ঐ অতি তুচ্ছ ইটঁকাঠের আড়ালটার মধ্যেই আমাকে তিলে তিলে মরতেই হবে। কত তুচ্ছ আমার এই প্রতিদিনের জীবনযাত্রা, কত তুচ্ছ এর সমস্ত বাঁধা নিয়ম, বাঁধা অভ্যাস, বাঁধা বুলি, এর সমস্ত বাঁধা মার — কিন্তু শেষ পর্যন্ত সেই দীনতার নাগপাশ বন্ধনেরই হবে জিত — আর হার হল তোমার নিজের সৃষ্টি ঐ আনন্দলোকের? We have been married for fifteen years, yet I have never written a letter to you. I have always been with you, you have heard my words as I have heard yours, and a letter has never been needed between the two of us. Today I have come to Srikshetra on a pilgrimage, and you have remained at work. Your relationship with Kolkata is like that of a snail within its shell, the city has become glued to your very body and soul. That is why you did not even apply for leave; God wanted it this way, he granted me leave. I am the Mejo-Bou, the second daughter in law in your family. After fifteen years of that existence, as I stand beside the sea, I begin to understand that I have another identity, in my world and in the eyes of my maker. That is how I have had the courage to write this letter, I do not write this as your Mejo-Bou. When I was a child and none but my destiny knew that I was to become part of your world, my brother and I both had typhoid. My brother died, I remained alive. All the local women said, “Mrinal has survived only because she is a girl, would she be here if she had been a boy?” Yama, the god of death, is an expert thief; he only takes things that are of some value. I will not die so easily. I have started to write this letter to explain that. That day when your uncle came with your friend Nirad to see me, I was twelve years old. Our village was so far from any town; the calls of jackals could be heard even during hours of daylight. They had to ride in a carriage for fourteen miles and then in a palanquin for the last three miles. It was an ordeal. Added to that was the rustic food that they were served at our house – your uncle still remembers that farce. Your mother was very insistent that the lack of beauty in her eldest daughter-in-law was to be compensated for by the appearance of your wife. What else would have taken them to that remote village? In Bengal, one does not have to seek out afflictions of the liver, spleen and the digestive system or brides – they are plentiful, appear of their own free will and then do not let go easily. My father was sick with worry, my mother called upon all her gods. How does a simple, rural offering satisfy the needs of an urban god? They had every belief in the allure of my beauty, but as I had no pride in that, it was only worth what the visitors from town would offer for it. That is why women remain unsure of themselves, even when they bear every outward sign of beauty. The apprehension that I saw in my house and even amongst my neighbours felt like a weight upon my heart. It felt as though the whole world had conspired to hold me, a twelve year old from a village, up in front of the scrutiny of two pairs of eyes – I had nowhere to hide. The day I came to your house, the whole sky seemed to weep in tune with the shehnai flute. Even after picking over every defect that I had in detail, the womenfolk decided that I was after all, beautiful. This caused my elder sister-in-law’s face to cloud over. But thinking back now, why did I need to be beautiful? If beauty was something that was shaped out of river clay by some ancient wise man, at least it would have a value, but beauty is something that God has created for his own amusement, that is why there is no real appreciation for it in the world of men. It did not take you many days to forget that I was beautiful. But you were all reminded at every step that I was intelligent. This was so natural for me that it has survived in spite of all these years spent in the daily grind of life with your family. My mother had always worried about this intelligence. This is truly the bane of a woman’s life. The one who must be shackled will suffer more at every step, if she is confronted by her own intelligence. But what was I to do; fate had carelessly given me far more intelligence than was needed by a daughter-in-law in a family such as yours and who could I return that to? You and the others railed against me daily, calling me a ‘know it all’ at every opportunity. Harsh words are the sole consolation available to the inept, for this reason I have forgiven you. There was one thing I did that was beyond the grasp of your comprehension; and I never let any of you find out about this. I used to write poetry in secret. Whatever the quality of those words may have been, it was not shaded by the narrow confines of your house. There lay my freedom. In that world, I could truly be myself. None of you knew that I was a poet for fifteen years; you would not have liked that part of me as it far exceeded my identity as the middle daughter-in-law. The first memory I have of your family home is that of the cow shed. The cows were housed in a cramped space beside the stairs that led to the living quarters, unable to move around much within that courtyard. There was a wooden feeding trough in the corner of that courtyard. The servants were usually busy in the mornings and the famished cows would lick and chew on the edges of the trough in frustrated hunger. My heart wept for them. I was from a village and had formed a kinship with the two cows and three calves the very first day that I arrived. When I was a new wife, I fed them from my portions secretly. When I grew up, my very public compassion for the cattle caused my contemporaries to express doubts over my family background. The daughter I had died soon after birth. She almost took me along with her. If she had lived she would have brought a touch of truth and the sublime to my life. I would have become a mother, not just a daughter-in-law. A mother may belong within the sphere of her own family but the world forever celebrates her as one at all times. I experienced the pain of becoming a mother but did not enjoy the freedom that came with it. I remember that the British physician who came to attend on me had been horrified to see our inner quarters, and I recall his anger upon seeing the birthing room. Your family home has a small garden at the front. The living room where the public are welcomed is well furnished. The inner quarters on the other hand are like the reverse side of a piece of needlework; there is neither beauty nor order. There the lights burn dim, fresh air enters surreptitiously like a thief, piles of rubbish remain in the courtyard, and the floors and walls are stained by years of shame. But the physician had made a mistake; he had thought that perhaps, we women suffered because of these circumstances, day and night. The very opposite was in fact true; neglect is like the ash that conceals both the fire and its heat within. When self respect is gone, neglect ceases to feel like an evil; there is no sorrow any more. That is why women are ashamed to admit to feeling sad. That is why I say to your kind, if the intention is to give women pain, it is best to keep them in neglect as love will cause them to feel the pain more acutely. No matter how badly I was treated, I never thought about unhappiness. In the birthing room, death came and stood near me. I felt no fear at all. What did I even have in life, that I would fear death? Those whose lives are anchored strongly in love and caring are the ones who fear to die. If death had called me that day, I would have released my hold on life as easily as a clump of grass pulls away from loose earth. Bengali women are always threatening to die. But where is the fulfillment in such death? I am ashamed to die; it is so easy for us. My daughter lived a life as brief as the flicker of the evening star. I went back to my daily routine and the cows. Life would have continued along that path till the end; I would not have needed to write a letter at all. But sometimes the wind can blow in a tiny seed that lodges in a crack in the floor, grows into the seedling of a great tree and breaks the bonds of bricks and mortar. The same thing happened to me. The day my elder sister-in-law’s younger sister Bindu came to our door for shelter after being abused by her cousin, you all thought, what a hassle! I was different; what can I say, I instantly felt a comradeship with this helpless girl when I saw the displeasure that you were feeling. To have to come to a stranger’s house for shelter in spite of their open disapproval – what a great disgrace that is. If she did have to submit to that, how could I cast her aside any further? I also observed my sister-in-law’s situation. She had obviously brought Bindu out of love. But when she saw her husband’s ill will towards the girl, she began to behave as though Bindu was a burden that she could not wait to get rid of. She did not have the courage to love her orphaned sister openly. She was committed to being her husband’s wife. My heart sank even more when I saw her plight. I noticed that my sister-in-law made very obviously inferior arrangements for Bindu’s food and board to show everyone where her loyalty was and asked her to perform the most menial of tasks. This filled me with sadness as well as shame. She was eager to prove to every one that Bindu’s arrival was a very good way of getting an extra pair of hands at little extra cost. Their family had once been well known. They were not blessed with either good looks or wealth. You know the story about how they had pleaded with your father before the marriage could proceed. She herself thought of her marriage as a grave slight against your family. She was always careful to be invisible in the household. But this became a problem for us. I cannot be submissive and invisible like that. You have had much proof of how I am unable to change what I believe to be right to comply with someone else’s opinions. I took Bindu into my heart. My sister-in-law said that I was spoiling a poor man’s daughter. She complained to everyone as if I had created a big problem. I know for certain, she was secretly relieved. Now it would all be my fault. She also felt better as she was able to get me to show Bindu the compassion that she herself was unable to. She always tried to pass Bindu off as a couple of years younger than she was. But even though she was not a day younger than fourteen, it would have been hard to tell if her sister did lie. She was so plain that if she fell and hurt her head, people were more likely to come and tend to the floor. As a result, there was no one to organize her marriage in the absence of her parents and not many with the mental fortitude to take on the responsibility of marrying her. Bindu came to me with much fear in her heart. It was as if I would not survive the shock of being touched by her. It was as if she knew that she had no right to be born and was intent in avoiding the world at all cost. It was as though she felt that she had no right to be born; she kept trying to avoid the world, staying out of sight. At home her uncle’s sons had not allowed her to have any space she could call her own if they could find another use for it. We allow unnecessary things to accumulate easily in our homes, but an unnecessary female is at once not needed and hard to ignore, hence even the rubbish tip does not accommodate her. And yet, it was not as if her cousins themselves were very important in the worldly scheme of things. But they are allowed to exist. This is why when I called Bindu to my quarters she trembled inwardly with fear. This made me very sad and I convinced her with much love that she was entitled to her own space within my room. But my room was not just mine. Hence the job was not very easy. After a couple of days, a red rash appeared on her skin, possibly a reaction to the heat, possibly something else. You all said it was small pox. It would have to be, seeing it was Bindu. A local quack came and said it would be hard to tell unless a couple of days passed. But why wait a couple of days? Bindu was dying of shame anyway due to the drama surrounding her illness. I said, ‘If it is smallpox, let it be so, I will stay with her in the birthing room, no one else will have to do a thing for her.’ Just as you were all growing infuriated with me over this stance and even Bindu’s sister was pretending to be greatly annoyed with her, going to the extent of suggesting a hospital visit, the rash disappeared completely. You were all even more distraught over this. You declared that the pox had gone dormant. Of course, it would have to be, seeing it was Bindu. A wonderful thing about being raised in neglect is that it makes the body completely indifferent to the wear and tear of life giving it a kind of immortality. Illness does not come near – all the roads leading to death are blocked off. This is why the malady teased her, but nothing happened. But it became quite evident that it was hardest to give shelter to the most unnecessary person on the face of the earth. The obstacles to shelter are greatest where it is most needed. When Bindu got over her fear of me, she had another problem to contend with. She started loving me with such intensity that she frightened me. I had never seen this face of love before. I had read about it, but that was between man and woman. 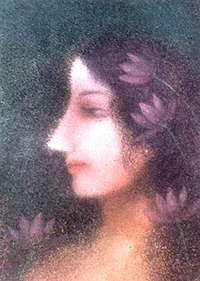 I had not had reason to dwell on my own looks in ages – but this plain girl reminded me of it after all this time. She could look at me for hours. She would say, ‘Sister, no one has looked at you like I have.’ The days that I did my own hair, she would be very disappointed. She loved to play with my hair, running her hands through its length. I did not need to get dressed up unless there was an invitation to go out. But Bindu pestered me each day to do something special with my appearance. She grew quite obsessed with me. There is not an extra inch of spare land inside your house. A Gab tree has taken hold somehow near the northern boundary wall next to the drains. The day that I would see the new leaves on the tree unfurl red and bright, I would know that spring had arrived on earth. When I saw that neglected girl blossom like that tree I knew that even the mind can have a spring awakening – it arrives from the heavens and not from the dusty stretches of road. The unbearable intensity of Bindu’s love disturbed my composure. I would get angry with her at times, I admit, but I saw the real me through her love that I had never seen before in my life. That was the natural me. The fact that I was showering so much affection and care on a girl like Bindu felt excessive to you. There was no end to bickering over this. The day that a costly bangle went missing from my room, you did not feel ashamed to allege that Bindu was sure to have a hand somehow in its disappearance. When the police came to look from door to door inn search of revolutionaries fighting against the British, you were easily able to say that Bindu was a female police informer. There was no proof of that except for the fact that she was Bindu. The maids in the household refused to do any of her work – if I asked them to do things for her – Bindu froze with embarrassment. My expenses went up for these reasons. I employed a maid just for her. You did not like that. You were so annoyed when you saw the clothes I gave her to wear that you stopped my allowance. The next day I got a few cheap clothes and started wearing them. When Moti’s mother, the maid came to clear my dirty dishes away, I told her not to. I washed my own dishes after feeding the calf the leftover rice. You were not exactly happy after seeing this accidentally one day. I still have not grasped the idea that it is fine for you to thwart my wishes but it is not alright for me to make you unhappy. In the meantime just as your anger was increasing, Bindu’s age was increasing too. You grew unnaturally agitated over what was after all a natural event. I am amazed at why you did not forcefully drive Bindu out of your house. I know quite well that you all secretly fear me. Within your mind you respect the intelligence that I was given by my fate. The groom’s family made no mention of coming to see her. Her sister was very reassured by this. But Bindu would not stop crying continually. I know how she suffered. I had fought many battles for her, but I could not bring myself to say that the marriage should not take place. Where was the strength that would allow me to do that! If I died what would happen to her? As it was, she was a girl, and a dark girl at that – who was marrying her, what was to become of her, these things were best left alone. My heart trembled when I thought of them. I scolded her but only I know that if she could have died painlessly I would have been pleased. The main thing was, there was no way out in any direction – Bindu must marry, let whatever happens afterwards take place. I had wanted the marriage to take place in our house. But you all said that it had to take place in the groom’s house, it was their family tradition. I understood that if you had to spend money for her wedding, it would go against the will of your guardian spirit. And thus I had to be quiet. But none of you knew one thing. I wanted to let my sister in law know but I did not, because she would have died of fright – I had secretly dressed Bindu in some of my ornaments. Possibly she did notice, but she pretended not to. Please, in the name of God, forgive her for that. Three days passed. I had saved the sheep that your tenants had given to you for slaughter from the pot and reared it by hand. Each day I fed it myself after waking up in the morning; I had given this duty to some of the domestic help but it was amply clear that they were more interested in eating the animal rather than feeding it. That day I went into that room and found Bindu huddled in one corner. As soon as she saw me, she clung to my feet and lay there crying quietly. Her husband had turned out to be insane. Bindu’s husband does not seem insane on first sight. But some days he grows so wild that he has to be locked in his room. He was fine on the wedding night but the next night the effects of staying awake and other things made him lose his mind completely. Bindu had sat down to have her lunch on a brass plate, he came and took her plate and threw the food away. For some reason he was convinced that Bindu was a queen and that the servants had stolen her golden plate and given her one of theirs. This was the cause of his anger. Bindu was frightened to death. When her mother in law asked her to sleep with her husband on the third night, she was petrified. The woman is capable of violent rages; she loses all sense when angered. She too is insane but not completely so and hence all the more dangerous. Bindu had to go into the room. Her husband was calm that night. But Bindu was paralysed with fear. When he fell asleep late at night, she managed to escape with great difficulty. There is little need to describe all that here. I had no reply to this. I could only curse my luck, what else could I do. Bindu’s brother in law had arrived in the meantime and was creating a big fuss. He said that he was going to report matters to the police. I then thought I would take Bindu to my room and lock the door while I sat with her inside. When I looked for her, she was nowhere to be found. While I was arguing with you she had gone outside and surrendered to her brother in law. I understood that she knew that she would land me in great danger if she stayed in this house. The consequence of running away was that Bindu increased her own pain. Her mother in law argued saying it was not as if her son was going to kill her up or anything. There were many examples of bad husbands in the world, in comparison her son was an angel. You remembered aloud glorious examples of devotion: the saintly wife who had carried her leprous husband to a brothel for his pleasure; it was little wonder that men who have been narrating this tale of the utmost selfish cowardice without qualms for ages were now able to vent their anger on Bindu without feeling a thing. My heart was breaking for her but for you people my shame knew no bounds. I was but a village girl whose fate had landed her in a family like yours; how did god give me such intelligence. I could not bear such wise words from you. If I had told him instead to abduct Bindu or perhaps smash her insane husband’s head into a pulp he would have been happier. When you saw Sarat with me your suspicions increased much more. I knew that you had never been able to accept the fact that Sarat came to our house. Your fear was that ‘the police were watching him – one of these days he would get involved in some political situation, then you would all become involved. That is why even on Brother’s Days, I had to send him my wishes via another person, I never invited him. I heard from you that Bindu had run away again, that was why her brother in law had come to our house to look for her. My heart sank when I heard that. I could understand her extreme anguish but there was nothing that I could do. Sarat went to see if he could find out anything. In the evening he came back and said to me, Bindu had gone to her cousin’s house but they had grown furious and taken her home immediately. They were still fuming over the money and time that they had spent over the business. You were all so happy that I was suddenly gripped by religion that you did not say no at all. It was also apparent to you that I might create a problem over Bindu if I remained in Kolkata. I was a great liability. He said, ‘There is no more need. Last night she set herself on fire and died. The nephew I had made friends with said she left a letter for you, but they destroyed that letter when they found it. You all said, ‘This is all a farce.’ That could be; yet why this farce is only enacted upon the clothing of the Bengali women and never on those of their brave men, that too needs some thought. Bindi was so unlucky. As long as she was alive, she had never had any compliments for her looks or other qualities – when she died she neglected to put some thought into finding a new process of dying that would make her countrymen applaud in delight – even her dying angered people. Her sister hid in her room and wept. But there was a sense of consolation in those tears. What ever had happened, it was a respite, it was not as if she had done any worse than die. What good would have happened if she had lived? I have come on a pilgrimage. Bindu did not need to come anymore, but I did. I did not have what people might understand to be sorrow in your household. The food and clothing was of a standard that was comfortable, you did not have any character traits that would make me call my Fate cursed in any way. If your nature had been like your brother’s, I would probably have passed my days like this and like his wife, placed the blame on the one responsible for husbanding the universe rather than on my own husband. That is why I do not wish to lay any complaints against you – that is not why I write this letter. But I will not go back to your house at No 27 Makhan Boral Lane. I have seen Bindu and the way women are viewed in life. I do not need to see any more. I have also seen that even although she was a woman, God did not abandon her. What ever power you all had over her was finite. She was greater than her accursed human life. You do not have the reach to crush her life for eternity under your feet as your will demands. Death is greater than you. There in the embrace of Death, Bindu is not just a girl from a Bengali family, not just an ill treated cousin sister nor a betrayed wife of an insane man that we knew nothing about. There she is eternal. The day that Death played his flute for the first time on the banks of the Yamuna of my life through the pain of that child’s broken heart; at first it pierced my soul. I asked my Fate why it was that the most ordinary of things was the hardest. Why did a tiny bubble of discontent spawned within the walled confines of this lane to become such an obstacle? No matter how much your vast world beckons with the intoxicating beauty of its six seasons, why can I not cross that little threshold and step outside? Why do I have to spend this amazing gift of life within this wonderful world of yours behind such an insignificant hurdle, dying a little at a time as I must? How very contemptible is my daily life, how insignificant its routines, its habits, its rituals, its utterances, and even its deprivations – but still in the end, why must the serpentine coils of those restrictions win – and this world of happiness that you have created lose? But the flute sang to me – where do these walls built by masons, where do the barbed wires of your domestic rules, what sorrow or insult has ever imprisoned the human spirit. Look, there flies the pennant of Life in the grasp of Death. Mejo Bou, have no fear. It does not take a moment to shed the husk of your existence as a second daughter in law. I do not fear your lane any more. Before me stretches the blue ocean and above me a lies a sky full of rain clouds. The darkness of your customs had covered me. For a short while Bindu came and saw my worth through a rent in that cloak. She tore it off completely with her own death. Today I step outside to find there is hardly room enough to contain my pride. The Beautiful one who has liked this unloved form of mine surrounds me with his gaze from the skies above. Now Mejo Bou, the second daughter in law, has died. This staying on is what surviving is. I too will survive. I have survived. This entry was posted on December 21, 2013, in Short Stories and tagged স্ত্রীর পত্র, streer potro, The Wife's Letter. সেই মৃত্যুর বাঁশি এই বালিকার ভাঙা হৃদয়ের ভিতর দিয়ে আমার জীবনের যমুনাপারে যেদিন বাজল সেদিন প্রথমটা আমার বুকের মধ্যে যেন বাণ বিঁধল। বিধাতাকে জিজ্ঞাসা করলুম, জগতের মধ্যে যা-কিছু সব চেয়ে তুচ্ছ তাই সব চেয়ে কঠিন কেন? এই গলির মধ্যকার চারি-দিকে-প্রাচীর-তোলা নিরানন্দের অতি সামান্য বুদ্‌বুদটা এমন ভয়ংকর বাধা কেন। তোমার বিশ্বজগৎ তার ছয় ঋতুর সুধাপাত্র হাতে করে যেমন করেই ডাক দিক-না, এক মুহূর্তের জন্যে কেন আমি এই অন্দরমহলটার এইটুকু মাত্র চৌকাঠ পেরতে পারি নে। তোমার এমন ভুবনে আমার এমন জীবন নিয়ে কেন ঐ অতি তুচ্ছ ইটঁকাঠের আড়ালটার মধ্যেই আমাকে তিলে তিলে মরতেই হবে। কত তুচ্ছ আমার এই প্রতিদিনের জীবনযাত্রা, কত তুচ্ছ এর সমস্ত বাঁধা নিয়ম, বাঁধা অভ্যাস, বাঁধা বুলি, এর সমস্ত বাঁধা মার — কিন্তু শেষ পর্যন্ত সেই দীনতার নাগপাশ বন্ধনেরই হবে জিত — আর হার হল তোমার নিজের সৃষ্টি ঐ আনন্দলোকের? I have also seen that even although she was a woman, God did not abandon her. What ever power you all had over her was finite. She was greater than her accursed human life. You do not have the reach to crush her life for eternity under your feet as your will demands. Death is greater than you. There, in the embrace of Death, Bindu is not just a girl from a Bengali family, not just an ill treated cousin sister nor a betrayed wife of an insane man that we knew nothing about. There she is eternal. The day that Death played his flute for the first time on the banks of the Yamuna of my life through the pain of that child’s broken heart; it pierced my soul. I asked my Fate why it was that the most ordinary of things was the hardest. Why did a tiny bubble of discontent spawned within the walled confines of this lane become such an obstacle? No matter how much your vast world beckons with the intoxicating beauty of its six seasons, why can I not cross that little threshold and step outside? Why do I have to spend this amazing gift of life within this wonderful world of yours behind such an insignificant hurdle, dying a little at a time as I must? How very contemptible is my daily life, how insignificant its routines, its habits, its rituals, its utterances, and even its deprivations – but still in the end, why must the serpentine coils of those restrictions win – and this world of happiness that you have created lose? But the flute sang to me – where do these walls built by masons, where do the barbed wires of your domestic rules, what sorrow or insult has ever imprisoned the human spirit. Look, there flies the pennant of Life in the grasp of Death. Second daughter in law, have no fear. It does not take a moment to shed the husk of your existence as a second daughter in law. I do not fear your lane any more. Before me stretches the blue ocean, above me a lies a sky full of rain clouds. The darkness of your customs had covered me. For a short while Bindu came and saw my worth through a rent in that cloak. She tore it off completely with her own death. Today I step outside to find there is hardly room enough to contain my pride. The Beautiful one who has liked this unloved form of mine surrounds me with his gaze from the skies above. Now the second daughter in law has died. This staying on is what surviving is. I too will survive. in fact I have survived.